During the winter period the MID landscaping team started weeding away in the MID area. With public safety in mind, it was decided to repair the broken fencing between Milner Road and the railway reserve and cut back the overgrown vegetation to improve visibility for the MID Public Safety Patrollers. These changes along the railway reserve in Milner Road positively helped the MID Patrollers who were able to prevent a stabbing/s after a resident reported four suspicious men chasing another knife wielding man inside the railway reserve near False Bay station! All suspects, including the potential victim, are known to the MID Patrollers due to their previous involvement in crime and suspicious activities. The patrollers managed to save the man from his attackers, who managed to get away due to one of the patrollers being injured whilst giving chase. The cutting back of vegetation provided the resident and patrollers with a clear view of the incident, allowing for a coordinated response between the MID Patrollers and GRIT. The repaired fence ensured that the assailants couldn’t escape into the road and provides increased safety for others. 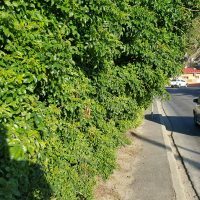 We urge all residents to please consider cutting back their overgrown vegetation as this creates perfect hiding spots and hinders line of sight for patrollers, other law enforcement authorities and neighbourhood watch patrollers when looking down streets as they patrol the area.